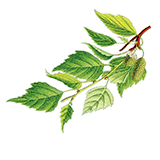 Birch leaves extract is an extraordinary natural ingredient. Proven in the folk tradition, used in case of problems related to poor peeling of the skin. It reduces itching and tightness of the skin affected and restores its flexibility and comfort. help to peel off excessive layers of the epidermis and gives skin a healthy look. Regulates sebaceous glands, including the scalp, reduces the symptoms of dandruff and prevent its recurrence.